It was in May that I last subscribed to LOTRO and attempted to progress through the Mordor expansion. I was under geared and under powered and the initial zone of Udûn was proving to be an up-hill struggle. So, I decided to level elsewhere in the game and managed to get as far as 111 (the current level cap is 115). I still couldn’t improve my gear so there was no point bypassing Mordor and going straight to the Dale-lands which were released in June in Update 22. So, I decided to spend my gaming time elsewhere and left LOTRO. However, the recent Bullroarer preview of Update 23 rekindled my interest in the MMO. Surely Mordor wasn’t the immovable obstacle that I thought? So, I subscribed once again, and returned to the game on Friday evening. Luckily, there were several kinship members online and they generously helped me until I reached the “tipping point” of the Mordor expansion. Two days later and I’ve nearly hit level cap and the game although challenging, it’s no longer the grind that it was a few months ago. In a nutshell the key to success in Mordor is gear. Specifically gear that has the “Light of Eärendil” defensive stats. This is designed to counteract a cumulative debuff known as the “Shadow of Mordor”. This is simply a new version of the Radiance stat that was found on Moria and Mirkwood raid sets back in the day. Without “Light of Eärendil” a player is severely gimped. 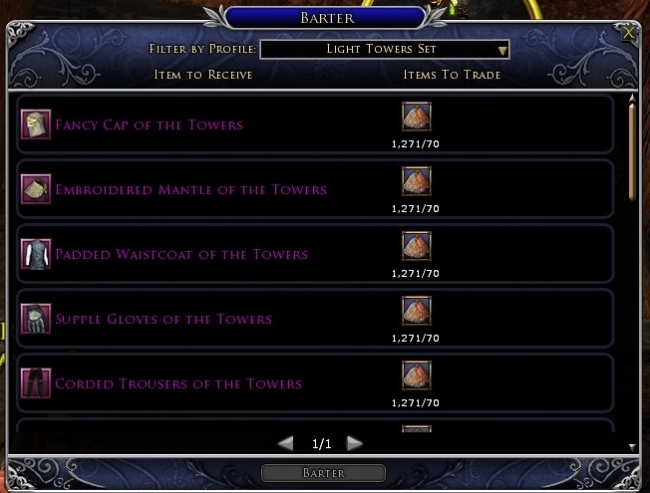 Mordor is essentially a major gear check for LOTRO. You start getting random pieces of new armour by clearing regional quests but it’s all very piecemeal. Hence the initial few levels above 105 are a slog. However, once you get to level 112, you become eligible to buy gear sets via the High-enchanter NPC, using the “Ash of Enchantment” barter currency. Players obtain this currency by deconstructing surplus gear they’ve obtained via quest, loot drops or Gorgoroth Steel-bound Lootboxes. Any item that has the “Light of Eärendil” can be broken down into “Ash of Enchantment” by using “Flame of Ancalamír” crystal. To cut a long story short, I was given several lootboxes and keys which provided me with enough “Ash of Enchantment” to buy a level appropriate gear set. I chose the “Light Tower Set” which favours DPS builds. Upon equipping the gear, my stats were significantly boosted, thus making questing in Mordor significantly easier. I have subsequently progressed through the Epic Story and some of the regional quests and expect to hit 115 in the next day or so. I have even gone so far as to plan ahead and determine which set I shall buy next. I estimate that to obtain all armour and jewellery for the “Light Expedition's Vanguard Incomparable Set” will cost about 4,800 “Ash of Enchantment”. The irony is however, that I shall only enjoy the benefits of this set for about a month or so, because once Update 23 is released the level cap is increased to 120 and they’ll be new gear. Now what has become apparent to me as I’ve progressed through Mordor over the weekend is the way that lootboxes have become more significant in LOTRO and I suspect that this may only get worse in future updates. A player can grind quests to get gear to convert to ash, but lootboxes offer a “far quicker solution”. I suspect that we are now finally seeing the consequences of Standing Stone Games “business relationship” with the Daybreak Game Company. However, that is a different blog post entirely. For the meantime, I’m back in LOTRO, making progress and having fun. Now that I’m no longer fixed upon the grind of the game, I must say that the various storylines in the Mordor expansion are very good. I like the way the SSG draws upon characters we’ve seen before in the game. It was a pleasant surprise to see Alti Spider-bane again. So, to those of you who have also fallen victim to the Mordor grind, there is a solution available, although it is not necessarily one that benefits the solo player. Being in a supportive guild and having access to shared resources helps immensely. Good luck.